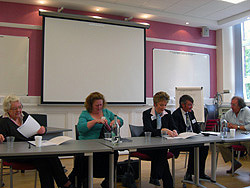 CMSW held a symposium on Variationist Corpora Online on the 22nd and 23rd of May, 2009. Around 40 guests and speakers joined us for two days of sessions and discussion panels, along with a meal at Stravaigin restaurant in the evening. 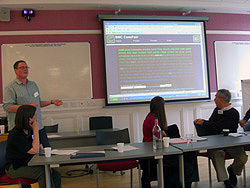 On the first day, Professor Mark Davies of Brigham Young University began with a keynote talk on genre-based variation and recent historical shifts, using the Corpus of Contemporary American English (COCA). Professor Bill Kretzschmar, of the University of Georgia, followed after lunch with a talk on variation online and the linguistics of speech, discussing the problems and pitfalls arising from recovering information online. Sessions were followed by a wine reception and book launch, presenting John Corbett and Wendy Anderson’s Exploring English with Online Corpora. Saturday featured two lively panel discussions, the first on spelling and punctuation in corpora and the second on challenges and opportunities in humanities computing.